Students would be trained in the skills needed to construct the railway, with the college set to open in 2017. This would be England's first new further education college for 20 years. Sir David Higgins, who is officially beginning his new job as chairman of HS2, said the college would address the problem of a lack of engineers. The former Network Rail chief executive warned that too often they "tend to go overseas". The scale and length of the HS2 project would help to retain engineers in the UK, he said, and the training programme would support the "national skills base". Business Secretary Vince Cable said the investment in the railway should "also come with investment in the elite skills which will help build it". Mr Cable said the college would "train the next generation of engineers in rail, construction and environmental studies that this country needs to prosper". The Department for Business, Innovation and Skills said the college would have "cutting-edge technology and use state-of-the-art equipment" to provide training courses for the specific needs of the rail project, which is expected to generate more than 2,000 apprenticeships. There are no details yet of where the college would be located or its funding. But the college would support the building of the HS2 line, which is intended to cut journey times between London, the Midlands and the North of England. The first phase, from London to Birmingham, is due for completion in 2026. Campaigners against the construction of HS2 have criticised the cost and disruption along the proposed route. Transport Secretary Patrick McLoughlin said: "HS2 will not only help businesses expand, creating employment; it will also give young people opportunities to get new skills, get a job and a career, become more secure and get on in life. 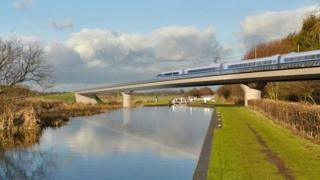 "When open, it is predicted that HS2 will underpin the delivery of 400,000 jobs." Skills minister Matthew Hancock said: "It is vital we act now to ensure we have enough skilled people to build HS2 and make sure as many jobs as possible are local. "This new elite institution with a specific focus on rail construction and maintenance will give learners new skills which respond not only to the needs of HS2, but also to the future of rail engineering, so is vital for Britain's future." There are 339 further education, sixth-form and other specialist colleges in England, which have been incorporated by act of Parliament. The proposed new college would be the first to be incorporated for more than 20 years, the business department said. Liam Byrne, Labour's shadow minister for universities, science and skills, said: "A year ago Ed Miliband urged the government to use the HS2 scheme to boost apprenticeships. "While any new training opportunities are welcome, particularly when almost a million young people are out of work, it is a shame that this announcement - of 2,000 apprenticeships over the lifetime of the project - doesn't match our ambition of 33,000 new places. "The Tory-led government has refused to back Labour's plans to use public procurement to create thousands of new apprenticeship opportunities across Britain." Michele Sutton, president of the Association of Colleges, welcomed that the college would provide "much-needed skills and technical expertise in industry-standard facilities". "Colleges are already delivering this kind of vocational training, therefore we are keen to learn more of the detail, particularly in relation to value for money and the financial alternatives such as existing colleges also taking on the task of meeting the needs of HS2 by upgrading or adapting existing facilities," she said.